Kids sure grow up fast these days! Prepare your soul: this week's PopMatters piece is about The Walking Dead. It's a spoiler-laden post, so I won't go into details here. At a broad level, it's about how the last episode (and actually the entire season in general) have been about transition points. The big one I identify is the transition from when the world of the zombie apocalypse stops being an event and instead becomes the status quo. 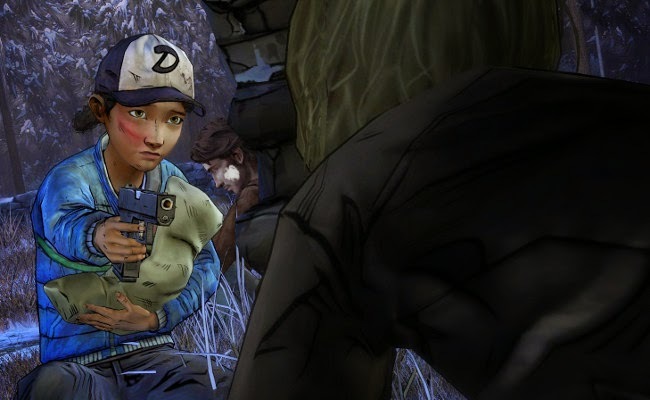 Clem is one of the last people around that even remembers what life was like before the collapse and she's rapidly having to shed that childhood. There's an infant in the group this season, and he becomes a symbol for a new generation of people that have never known anything but the post-apocalypse. One of my personal weaknesses is a tendency towards regretful nostalgia. It's the sense that maybe a missed opportunity can be recaptured or a mistake can be undone. In retrospect, this is why Season 2 was such a hard one for me. Baby AJ is the most extreme example, but the episodes are littered with messages that there is no going back to what we consider normal. It's tempting, but ultimately futile to try. Season 2 didn't have the same immediate punch that Season 1 did, but I'm starting to increasingly appreciate the thematic shifts now that I have had some time to reflect. The Walking Dead is now past the point of showing the society's destruction; it now has to focus on how people adapt and what it means to continue after the fall. On a final game-related note, I'm still fascinated to hear how other people's stories turned out, because there are significantly different outcomes. Do you still wistfully remember the old days, or have you (wisely) abandoned nostalgia?